Don’t golf and want to buy a custom golf bag as a gift? Read this. Everything a non-golfer needs to know to choose the right custom golf bag. 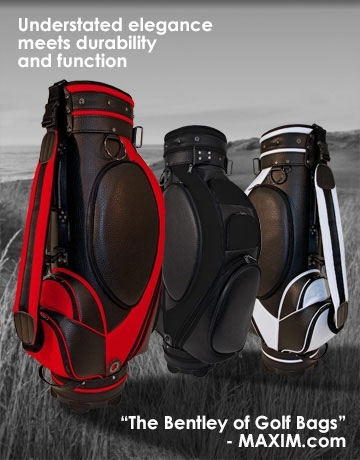 This article is for people looking to buy one golf bag for a gift. Stand bag or cart bag? A stand bag is lightweight and easy to carry walking. You can also put it on a cart. A cart bag is heavy and golfers never use them walking UNLESS they use a walking cart, and not carry it on their shoulders. Even in that case most golfers are looking for a lightweight bag. Casual or Business? The typical country club user may prefer a quality bag with a bit of personalization. The working CEO or tournament player prefers more flash so they can show off their brand. The best choice for a custom stand or ‘carry’ bag is the Aficionado by Club Glove. It comes in 5 stock colors. Flat rate $10 for shipping. Because of it’s size, shipping can be expensive so be careful if you look at other sources. Ships in about 2 weeks with a custom name; or allow 2 weeks after art approval if adding a logo. The best choice for a country club bag is the Luxury Cart bag by Club Glove. It comes in 6 stock colors. Corporate customers can create custom bags with quantity purchase. FOR BUDGETING, here are estimates: Add a logo or image from your high resolution art file, starting at $50 per location per side. Add an image from our stock art (USA flag, or Club Glove Logo) , starting at $30 per location per side. Add an embroidered American Flag on the belly pocket, $20 Add your name, nickname or initials: Included in base price FREE. The best choice for an executive who enjoys playing in golf tournaments the Billboard bag by Club Glove. The premier bag for dignataries and CEO’s. You can add embroidery on all 4 sides and the carry strap. You can download a layout form here. Instead of size embroidery, a custom inlay is frequently recommended. It comes in 6 stock colors. You can have any color and any design you want, from zippers and all decoration, however, a single bag (the master can be used to produce others) costs about $3500 and up. It comes in two sizes 8.5″ and 9″, the latter reserved for tour players. Shipping is based on cost, from $50 and up. We reserve the right to adjust shipping fees to match our costs. Ships in about 4 weeks after art approval, depending on customization. FOR BUDGETING, here are rough estimates: The average request includes set up fees for a logo on each side and a name, typically priced from $450-700. Add a logo or image from your high resolution art file, starting at $50 per location per side. Add an image from our stock art (USA flag, or Club Glove Logo) , starting at $30 per location per side. Add an embroidered American Flag on the belly pocket, $25 Add your name, nickname or initials: Included in base price FREE. Shipping is usually $75 and up. Why CEOgolfshop? Most brands on the market are covered with brand advertising. 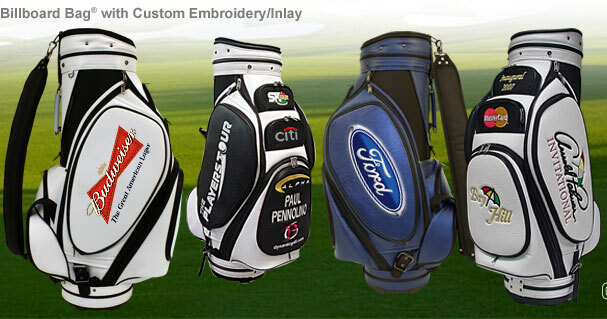 You can’t customize them like you can with our golf bags because there is no blank space to add customization. Can I add my college logo? No, not unless you have specific rights to use their logo. For colleges, that is highly unlikely. For high schools, they usually send approve logos for golf team members. Can I add a brand logo if I don’t work for the company? No, You must have rights to all logos on the bag. For example, we are often asked for BMW bags by BMW owners. Contact your dealer and have him give us a call. Can I customize the bag colors? No, not for a single unit purchase. Corporations can contact us for options on 24+ units for stand bags and luxury bags. The Billboard bag can be customized for any quantity, but it is generally not practical on small runs. Can I add a name or nickname? Yes. What is a .DST file? It’s an embroidery format. You cannot produce it on your computer. It requires special software and it includes instructions about depth, width etc for the embroidery process. If you’ve used the logo on other materials, you may be able to get that file from whoever did the project to use for the logo on the bag. Please note you can’t stretch the file- it will print at the same size as it was originally created. What if I don’t have a .DST file? It’s $50-100 to create one for you, depending on the complexity. GOOD TO KNOW: If you buy a Billboard bag, consider buying the a travel bag. The number one bag on tour also has a number one travel bag to go with it. How much does it cost? See our online store for the latest colors, options, model and prices. The Windbrella 68″ golf oversized umbrella is now in stock for immediate shipment. Our regular customers know this item has been special order only in the past so we anticipate a quick sell-through. The 68 is the largest size, typcially used by tour players due to the size being big enough for player and caddy to huddle under. Our umbrella review is below. In Stock Colors: These colors are in stock for immediate shipment. We’re currently out of black. Advance Ordering Colors: SOLID, TWO-TONE, OR CHECKERBOARD Options with 144 unit minimum. Black, navy, burgundy, burgundy cream, hunter/cream, black/tan, red/white, navy/white, black/white,black/red check black/white check. Private label umbrella: Choose from options including custom fabric colors, adding logo embroidery on close strap, hang tag, logo imprinting and other details. What makes the Windbrella 68″ golf umbrella the best? Ease of use. When you’ve tried different umbrella’s you can really appreciate that this umbrella pops open and closes the smoothest of any we’ve ever tested. Others may claim to be pinchless, but in my experience, they were not. The big grip slider is key to making this pinchless. Durability. Lightweight compared to some other brands, yet durably constructed, thus the lifetime warranty. A big difference is in the finishing detail with seam finishing and fiberglass parts instead of plastic and a few knots tied with a little thread. Everyone has experienced an umbrella with parts that break. I got my first Windbrella over 10 years ago and it’s still in great condition. The construction has gotten even better. Quality screen imprinting. Mine lasted about 8 years before it started to have any peel, and even now it still looks pretty darn good, if not perfect. If you’re putting your logo on an umbrella, you want it to be associated with the best product. This Windbrella delivers the best, and because of it’s durability, the recipient will continually associate your name with the great product they love. Send a 10″ x 7″ high resolution art file with PMS colors indicated with your order. Custom Orders/Reorders – 24 pieces new, 12 reorder. Undecorated goods – 1 piece. Buy the 68″ golf umbrellaonline now at CEOgolfshop. Reviewers comments: The 62 inchgolf umbrella has always been more than adequate size for me personally, though at 5’2″ I’m smaller than most; I prefer the lighter weight and size of the 62, as have our customers. Whether that’s due to price or function, the 62 has reigned as most popular. I’ve ordered other brands for product testing. Function is my number one priority. How easy does it open and close? The Windbrella remains my hands down favorite and for that reason we do not offer other brands at CEOgolfshop. We could. We choose not to, because our goal is to offer the very best. CEOgolfshop offers the full line of Bryan Symonds Design custom golf clubs. As a die-hard brand name only club buyer, I was hesitant to consider a brand that I was not familiar with. However, an hour in the practice area, and I was convinced my Cleveland wedges were sub-par compared to these. I’m not a professional golf tester, and at 17 handicap, not the best golfer either. But I have played some stellar rounds. Fortunately, I hit awesome immediately with the prototype wedges. At first glance the club face seemed smaller than my Cleveland wedges so I was concerned about mishits. I needn’t be. My very first shot was an awesome hit with nice loft that plunked down on the green and spun back just a bit. At Naples Grande it can be very difficult to hold the greens so I’m thrilled with how easy it was. For me personally, I can get that result with Cleveland 60 degree lob wedge, but not my other wedges. I hit my Brian Symonds Design Prototype Wedge more consistently with ease and control than my ‘brand’ wedge. “One of the major playing characteristics that separate the Brian Symonds Design Wedges from many others is the heel grind on the sole of the club. The rounding and flattening of the sole’s heel lets the player hit golf shots and pitch shots off the tightest of lies. By spin-milling the face of the club the player can now stop a ball on the firmest of greens.” I can attest to that. Bryan has been grinding custom clubs for two decades and has many fans. Brian Symonds Design Wedges are a blend of tradition and technology. They have a sharp, classic look that was popular with players like Tommy Armour, Ben Hogan and Bob Hamilton. By using 304 Stainless Steel, Brian Symonds has achieved one of the softest feels in a golf club today. Whether you are hitting a full shot into a green with his 52 degree wedge or executing a delicate flop shot out of deep rough with his 60 degree club you will feel in complete control of the ball coming off the club face. Today’s Touring Professionals, Top Amateurs and average players demand a wedge that is reliable in the fairway and the rough but that is proven in the sand as well. Brian Symonds Design Wedges give the player the best of both worlds: just the right amount of bounce to play any bunker shot and the sole design to hit golf shots you only dream of. There is no doubt these classically designed wedges combined with today’s technology will dramatically improve any player’s short game. I agree. My test on tight lies was more solid shots generating backspin with very little effort. Again, since I’m an 17 handicap, it was harder for me to consistently acheive this with my Cleveland wedges. A PGA professional for 30 years, Brian Symonds has been designing and custom grinding wedges for more than a quarter century. He has provided instruction and ground wedges for tour players on all 4 professional tour organizations. Our mission at CEOgolfshop is to deliver high quality products that can be customized as gifts for corporate executives, celebrities, and those who care about the best in quality. These clubs can be customized, and personalized with a custom branded golf grip, and you can also engrave on the club face. We recommend the prototype wedge with a custom golf grip for most tournament gifts. Players of all levels will enjoy these clubs. MSRP with a custom grip is $89. We offer them in with quantity discounts. With expenses covered, a support team can attend your tournament and custom fit players at your event. The oil can wedge is for very low handicap and scratch golfers and for those who spare no expense for their tournament gifts. Examples of custom golf grips installed on demo club stems.